In 1980 the 71st and 72nd Fighter Aviation Corps command and the 16th Tactical Air Army command was reorganized. 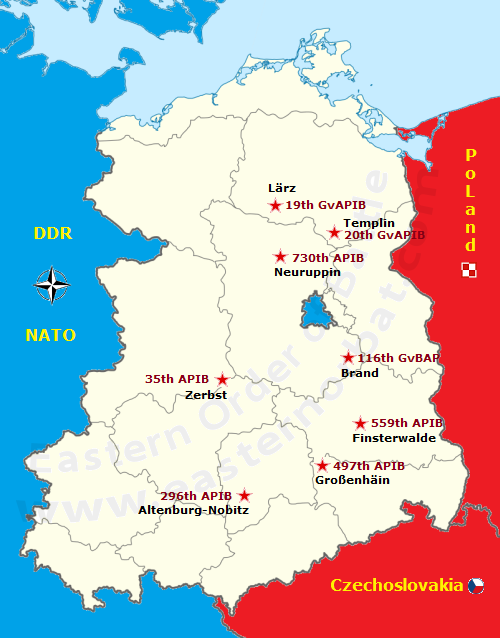 Instead of them the Soviet Air Forces of the Western Group of Forces’s Command was formed. Also from the end of the seventies the silver and gray coloured airplanes were gradually repainted to camouflage. The 16th Air Army most modern fighter type is the MiG-23MLD Flogger-K. Between 1974 and 1978 the Soviet Tactical Air Force deployed six regiment (~ 180 pcs) Su-24 Fencer to Eastern Europe. In response the USAF deployed four squadron (~ 100 pcs) F-15 Eagle to Western Europe between 1977 and 1980, and later MIM-104 Patriot and MIM-23 MIM-23 Improved Hawk air defense systems. NATO's strengthened air defense made thing more difficult for the Soviet 16th Tactical Air Army. 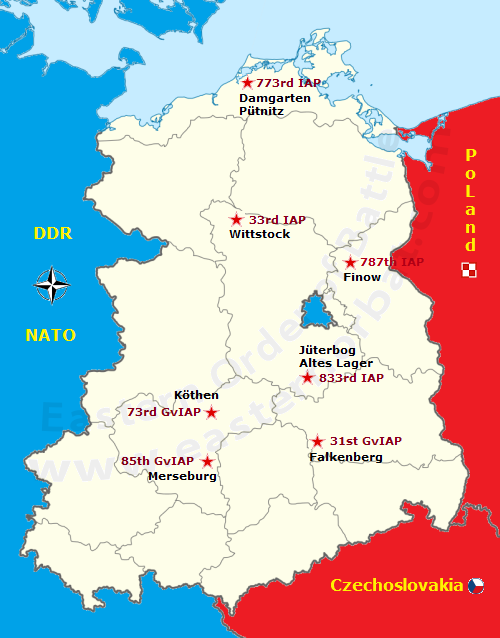 The fighter forces were reorganized in 1982. Existing MiG-21SM Fishbed-J, MiG-21bis Fishbed-L and MiG-23M Flogger-B soviet tactical fighters was unable to compete with the F-15 Eagle. Therefore the Tactical fighter air units were reduced temporarily in the GDR. Only six out of nine soviet tactical fighter regiment remained. Three out of the six tactical fighter regiment received more maneuverable, more modern type of MiG-23MLA Flogger-G between 1979 and 1980. Also they have started to prepare for the new MiG-29 Fulcrums. * Possibly they still used MiG-21SMT as well. ** Not tactical, but interceptor regiment. The 787th Tactical Fighter Air Regiment was converted to air defense - interceptor regiment. It gradually received MiG-25PD Foxbat-E interceptors. Their task was to check the USA Strategic Air Command's SR-71 Blackbird strategical reconnaissance planes. The Mig-25 Foxbat technologies and personnel came from the Belorussian Military District's 2nd Air Defence Army to GDR. In 1983 only one of the 787th regiment's squadrons used high-speed squadron MiG-25s, but later all three squadrons replaced the old MiG-23s. The Soviet 16th Tactical Air Army planned to overcome NATO's strong air defense with quality and the quantity in the early eighties. Quality: They started the Su-24 supersonic, all-weather attack aircraft's deployment to Germany. In 1981 the 116th regiment received the first Su-24s. The new offensive machines could have defeated the NATO's air defense. 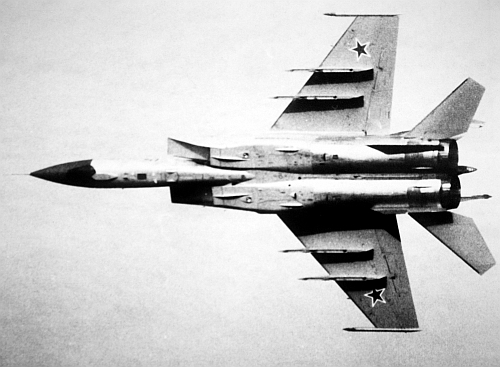 The Su-24 Fencer was the USSR's first tactical bomber that was capable of missions day or night in all weathers. It had the ability to fly at supersonic speed and at low altitude for extended periods of time in order to traverse NATO's air defense. The Su-24 would have been a serious opponent for NATO's air defenses. 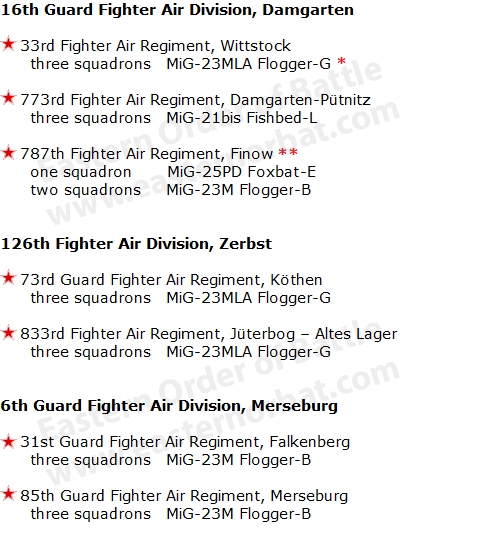 Quantity: Two fighter regiment was reorganized to fighter bomber regiment. 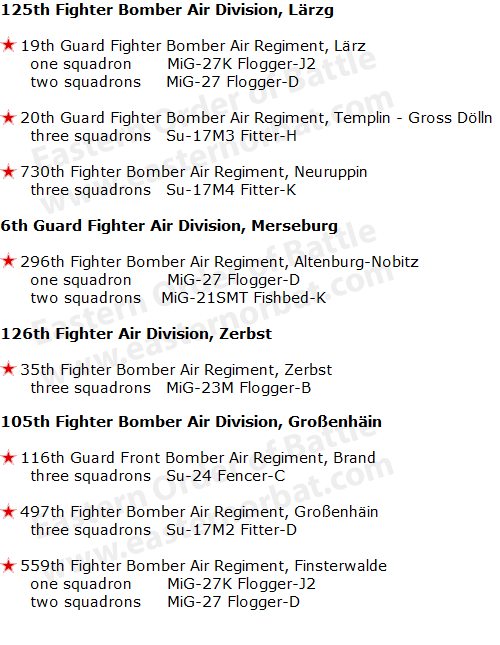 The 16th Air Army operated eight fighter-bomber regiments from 1982. Furthermore they received precision attacking jets between 1980 and 1983. 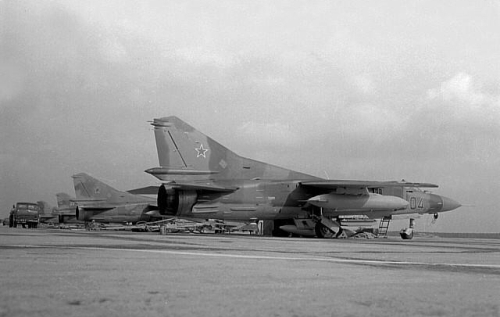 Two squadrons of MiG-27K and two regiments of Su-17M3 and M4 type. These types were the most advanced Soviet variant, with a laser designator and compatibility with TV-guided electro-optical weapons. The air army's reconnaissance aircraft types have changed little during that time. The 239th Independent Helicopter Regiment with Mi-8 Hip and giant Mi-6 Hook helicopters was transferred to the Army. Instead, the Air Force received the 292nd independent Helicopter Squadron for Electronic Warfare with Mi-8PP ECM helicopters. 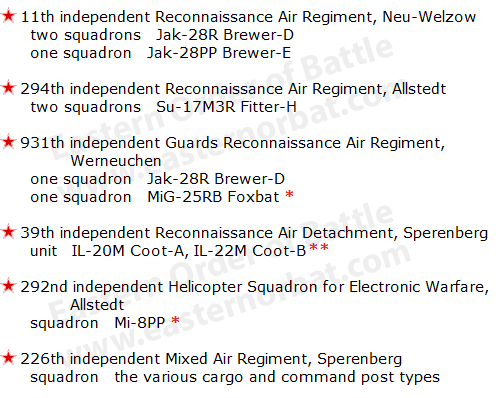 * The exact sub-variants used aren't known ** Central Command subordination.